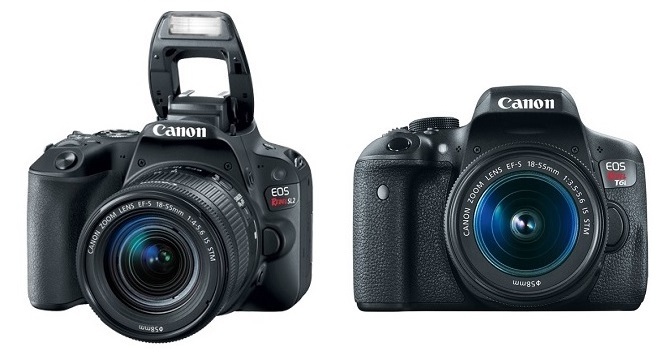 The comparison of the Canon SL2 versus T6i DSLR cameras is an interesting one. Both cameras look similar, both carry the Rebel brand name, both have the same resolution and size of image sensors, and both carry almost identical prices. The Canon T6i has a few performance advantages, but it +is quite a bit older than the SL2. We’ll help you break down the key differences between these two Canon entry-level cameras to see which one will fit your photography needs better. Here are the Steve’s Digicams quick thoughts on these two cameras. Canon SL2: The Canon SL2 caters to inexperienced photographers, as it includes an improved/guided menu system to help you set up the camera and learn to use its features. The SL2 offers quite a few upgrades from its predecessor (the SL1), including the stunning Dual Pixel CMOS Auto Focus (for video recording & Live View still shooting), and it appears at a very desirable price point for a DSLR. 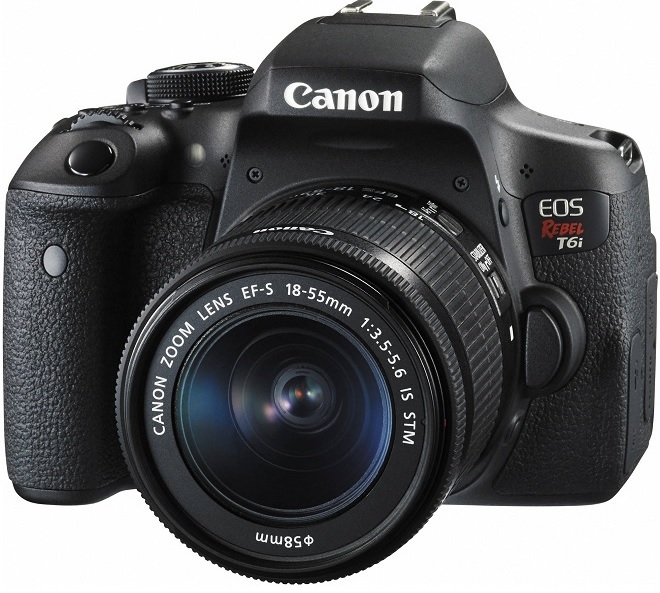 Canon T6i: Canon released the T6i in 2015, positioning it as the top entry-level Rebel camera. 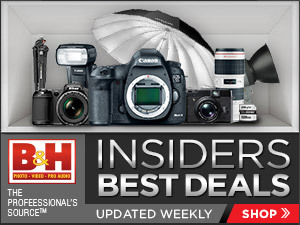 Since then, Canon has released the T7i, but you can still purchase the T6i, and now at lower price than when it was introduced. The Rebel T6i was a welcome introduction, as it offered several improvements over its predecessor for better performance and images. Here are the primary similarities between the Canon SL2 and the Canon T6i. Image Resolution: The SL2 and T6i each offer 24.2 megapixels of resolution. Image Sensor: Both models feature an APS-C image sensor that has 332 square millimeters of coverage area. LCD Screen: The T6i and SL2 each have a touch and tilt/swivel display screen, which is great for odd-angle photos. Lens Mount: Both cameras use EF lens mounts. Microphone Jack: You’ll receive better audio quality with your video recordings with these two Canon cameras, as both have a microphone jack. Popup Flash: Both cameras have a built-in flash unit for convenience, as well as a hot shoe to attach an external flash unit or better performance. Price: Canon has brought the price of the older Rebel T6i down to the point that it’s basically identical to the newer Rebel SL2. Wireless Connection: These two DSLRs each have Wi-Fi and NFC connectivity options, but the SL2 is the only one to allow a Bluetooth connection. Here are the primary differences between the Canon SL2 and the Canon T6i. AF Points: The T6i has 19 autofocus points, all of which are cross-type, while the SL2 has just nine AF points, only one of which is a cross-type AF point. Battery Life: The newer SL2’s battery can record roughly 50% more photos per battery charge than the T6i. 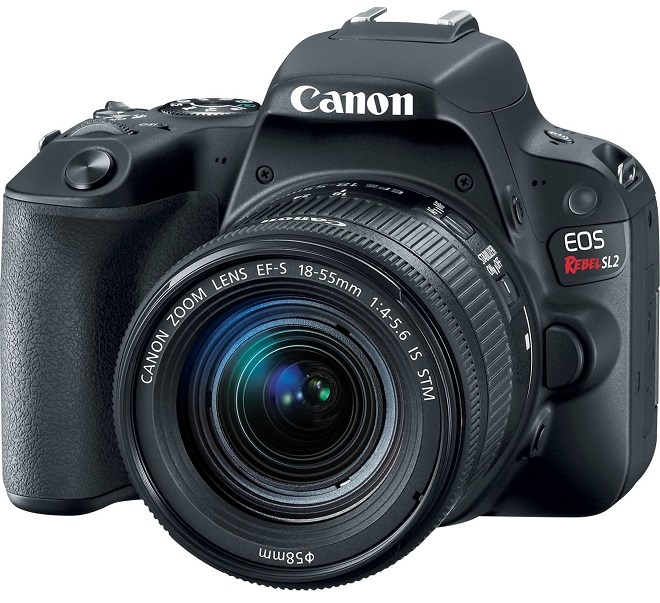 Burst Mode: Canon’s Rebel T6i has an unlimited memory buffer for shooting JPEG photos in burst mode, while the SL2’s memory buffer can only handle 20-25 JPEG photos at a time. Dual Pixel CMOS AF: The Canon SL2 features the company’s newer, more accurate phase-detection AF system anytime you engage Live View (use the LCD screen rather than the optical viewfinder). Meaning, if you’re vlogging or shooting stills with the SL2, the AF system is going to do a much better job tracking subjects than the T6i’s older Hybrid CMOS AF system. Image Processor: The Canon SL2 has a newer image processor (DIGIC 7) than the Canon T6i (DIGIC 6), which leads to faster performance levels. ISO Range: The Rebel SL2 has a slightly better maximum native ISO setting (25,600) than the T6i (12,800). Movies: Although both cameras have a maximum video recording resolution of full HD (1920×1080), the SL2 does offer a faster frame rate. The Canon SL2 records full HD video at frame rates of 60p, 30p, and 24p, while the Rebel T6i records full HD video at 30p and 24p frame rates. Both record in the MP4 format. Size: The SL2 is smaller and weighs less than the T6i. 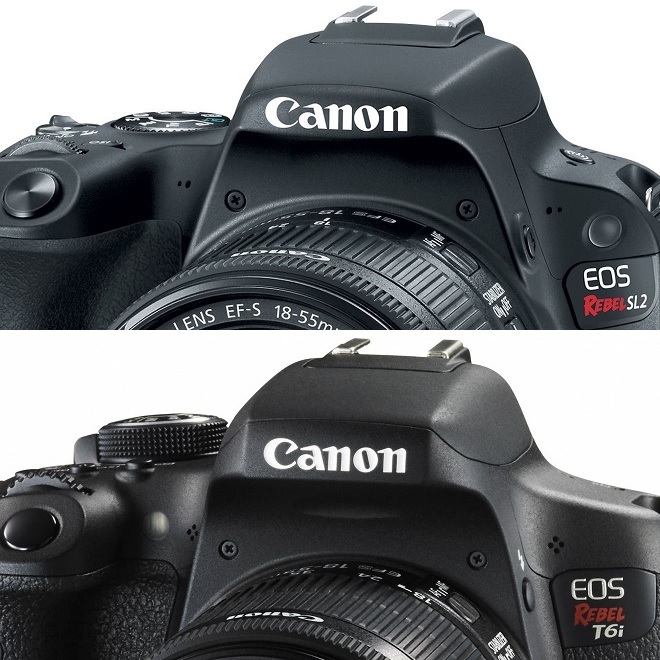 The Rebel T6i’s physical size is about 10% larger than the SL2, and the T6i weighs about 22% more than the SL2. Even though the Canon Rebel SL2 and T6i look similar, there are a few differences that will help you pick the model that will works well for you. If you want a lighter and smaller DSLR with better video quality and autofocus, the SL2 is as small as it gets for a Canon DSLR. Or if you simply need the newest entry-level camera you can find with a newer image processor, the Rebel SL2 is the choice again. However, the T6i is significantly better than the SL2 in burst mode and in speed and accuracy of autofocus points (when using the optical viewfinder), which is great for action photos. Each camera has an almost identical price point, so think about how you plan to use the cameras, and pick the model that’ll fit your needs better. In other words, if you want to shoot video AND stills, get the SL2; if you’re more focused on still photography, get the T6i. One of the smallest and lightest DSLRs available. Better still photography AF performance via the optical viewfinder. Good options for action photography. Kyle Schurman is a freelance writer who has been writing about digital cameras, the technologies behind them, and related consumer electronics since digital cameras began appearing on the consumer market. His first digital camera had 0.5 megapixels of resolution!